Arup have deployed the Pexip Infinity scalable software platform worldwide. 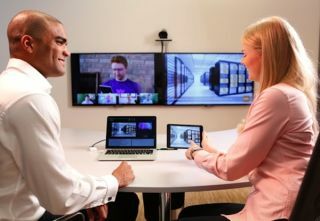 The deployment will enable Arup’s 11,000 staff across 38 countries to use high definition video, voice and data collaboration and will also be used to connect to Arup’s clients. “In Arup, we aim to introduce new, forward thinking, innovative and simple to operate technologies into our business. The deployment of Pexip Infinity will not only reinvent how our company communicates internally but will also change how we communicate with our external clients,” said Roy Salfarlie, Head of AV, UKMEA AV Media Services at Arup. “Initially, within our proof of concept for next generation virtual meeting rooms, we were evaluating bridging solutions from three different vendors. However, we found these to be more complex than needed – they also required proprietary hardware and could not achieve satisfactory interoperability and HD video integration with Microsoft Lync. Pexip Infinity was brought in through a revised vendor list. It met our requirements for a software-only solution and we had it working globally in less than two hours. We were really impressed,” explained Chris Ellen, Unified Messaging Team Lead at Arup. Arup were traditionally using Cisco Jabber but wanted to extend their mobile video portfolio by introducing Microsoft Lync. “Using Pexip Infinity means you can dial in and use the same PC or device for a video call but at increased quality. We don’t have to license additional software clients either which is an attractive value proposition,” Ellen said. Arup staff are issued with a personal Virtual Meeting Room with a PIN number for security. Individual users can control their conferences and view presentations from their own mobile phone or tablet. “Our existing video infrastructure was physically restricted by the number of hardware boxes in our network. With Pexip Infinity, there’s no restriction on the number of people that can use the system. The platform is always on and always available, which enables the team to connect instantly whenever collaboration is required in their workflow,” said Ellen. Arup intend to extend the solution to incorporate client meetings. “We can now use the Pexip WebRTC functionality for external meeting participants. In the past we had to ship a copy of Cisco Jabber and provision a user account. This was cumbersome for everyone involved, it introduced a delay and had a cost attached to it. With Pexip Infinity we now just email a URL and external callers can experience professional quality video via their web browser,” said Ellen.